Winter brings along with it, its varied range of winter fruits starting from apples, bananas, grapes, dates to guava, oranges etc. Out of all these one fruit that is worth mentioning is our very favourite custard apple. Popularly known as “Sitaphal” or “Sharifa” in India, custard apple is quite popular with people of all generation and is widely consumed in the form of shakes, smoothies, desserts or as a snack. But do you know that besides its unique taste, it is highly nutritious and hence highly beneficial for human wellbeing? Well in case you are unaware let me tell you that custard apple is highly beneficial for our health and beauty. And today in this post, I will discuss about the top 14 health benefits of custard apple (Sitaphal or Sharifa) that certainly cannot be ignored. “Annona reticulata” or custard apple is a light green fruit having a bumpy skin surface. It is believed to be originally from the South America and West Indies but is now widely found all over India, Pakistan and Bangladesh. Custard apple is available in many shapes like the symmetrical heart shape, irregular, round, lopsided or oblate with a depression at its base. The pulp is sweet, aromatic, fleshy and little acidic in taste. The unique taste of Sitaphal or Sharifa is quite similar to that of sweet custard and cooked apple that has contributed to it being commonly known by the name of custard apple in most parts of the world. Due to its amazing medical properties, custard apple is an important name in Ayurveda and has been used for treating various health issues, most of which I am going to discuss with you today. However, before that let’s take a look at the list of nutrients it contains that makes it such a healthy fruit for human well being. Custard apple is a powerhouse of nutrients and it can help you fight various diseases including diseases related to heart, diabetes, body weight, immunity and eyesight. The presence of various minerals, vitamins and antioxidants boosts the immune system of our body that helps us to fight various germs and infections that weaken our health. Some of the common nutrients found in custard apple are vitamin C, vitamin A, potassium, iron, calcium, magnesium, copper and fiber. According to “World Journal of Pharmacy and Pharmaceutical Sciences” custard apple is full of various nutrients and antioxidants that help us remain healthy. It is good for our heart, brain, digestive system and helps to fight various diseases like diabetes, cancer, anemia etc. 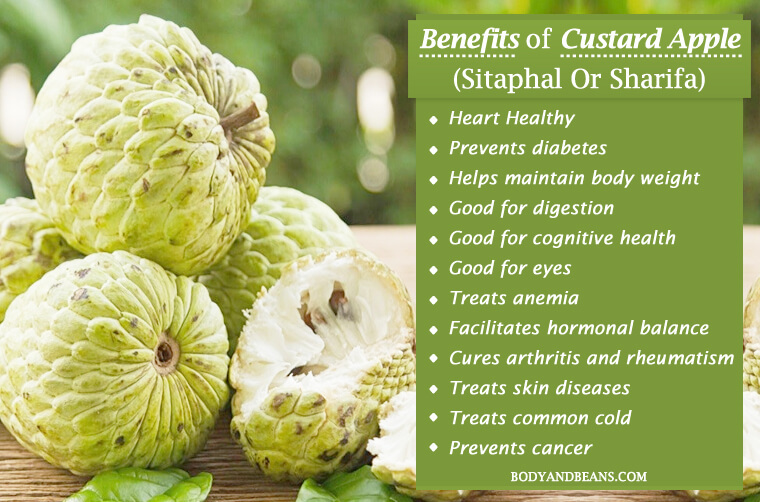 Here’s the extensive list of top 14 health benefits of custard apple (Sitaphal or Sharifa) worth knowing about. Several unhealthy habits and junk foods intake have resulted to weaker hearts that in turn has led to various cardiovascular problems in the recent past. You must protect your heart and in order to keep your heart healthy, you should eat custard apple. This fruit is rich in potassium and magnesium that helps our body prevent heart diseases. They help in relaxation of muscles and prevent the cramps and jerks thus lessening the possibility of strokes. Sodium content along with potassium also controls the blood pressure levels and inhibits its sudden fluctuations in human body. Cholesterol that is another main cause behind heart issues can also be maintained with the niacin and dietary fiber present in custard apples. In addition, custard apple contains vitamin B6 that aids to inhibit homocystein collection and hence lessen the risk of the occurrence of cardiovascular diseases. Custard apple prevents the attack of the free radicals on the lipids further fostering cardiovascular health. Lastly, the flavonoids in custard apple also contribute to heart health. Diabetes is another leading killer in the world but with custard apple, it is possible to prevent it from occurring. The dietary fiber present in this fruit helps to absorb the blood sugar levels and thus prevent the risk of Type II Diabetes. Further, the presence of Vitamin C in custard apple also helps to regulate the blood sugar levels thereby further giving protection against diabetes. Also, it contains magnesium and potassium that helps in production of the insulin and regulates the glucose content in body. The anti-hyperglycemic property of the methanol extract of custard apple is also very beneficial and hence many recommend custard apple to be safe for diabetic patients. Today, most people seem to suffer from weight issues. While some have overweight problems, others seem to suffer from malnutrition and underweight issue. So if you fall in the latter category and want to gain few kilos, start consuming custard apple for it helps maintain proper body weight. The sugar present in the fruit improves the metabolic rate of the human body and stimulates your appetite and with more appetite, there will be more healthy food intake. Therefore, if you are excessively thin and want to gain few kilos, do consume custard apple but in adequate amounts as over-intake may lead to excessive weight gain. You may mix a bit of honey with the custard apple and consume it in regular basis to gain a few healthy pounds and make you look a bit rounded and healthy. Custard apple can give a boost to your digestive health and that is definitely one of the important health benefits of custard apple. Many people suffer from constipation and other digestive issues that can be prevented with custard apple. The rich amount of copper and the dietary fiber present in it helps in proper digestion of the food particles. Also, the fiber helps to add bulk to the stool and thus ease the bowel movements and facilitate smooth elimination of excreta. Custard apple also helps to flush out the harmful toxic substances and protect our liver and kidneys. Besides, if you have problem with diarrhea and dysentery, you can consume the powder by crushing the sun dried custard apple. Our hectic lifestyle often cause a lot of mental stress that can affect our overall cognitive functioning. However, according to reports custard apple contains a high level of vitamin B6 that regulates the levels of GABA neuron chemical in your brain. This makes you get rid of excessive stress, irritability, nervousness, tension and depression. It also helps in better retention of memory and reduces the side effects of Alzheimer’s. Moreover, the nutritious custard apple also protects our central nervous system and prevents the occurrence of Parkinson’s disease. You need to take care of your teeth as with age, they weaken. As a solution, you may consume custard apple in adequate amounts as it fosters dental health. The rich iron and calcium helps to strengthen your teeth and prevent it from falling. It is also said that the outer covering of the fruit is good for preventing tooth decay and the gum pain that accompanies it. In fact, often the bark of this plant is also put around the gum to reduce the toothache. Custard apple possesses anti-cancerous properties, which is indeed one of the most important health benefits of custard apple (Sitaphal or Sharifa). The bark of this tree contains tannin and has astringent effects that are used for making various herbal supplements that further gets used in the cure of various types of cancers. The presence of alkaloids and acetogenin reduces cancer risk and protects against renal failure. These compounds act against the cells affected by cancer without causing any harm to the healthy ones. Moreover, custard apple also contains antioxidants like asimicin and bullatacin that help your body neutralize the ill effects of the free radicals thus, further reducing cancer risk. It also flushes out the harmful toxic substances and lessens the occurrence of colon and liver cancer. Few reports also suggest its effectiveness in preventing breast cancer as well. So if you want to remain away from cancer, eat this wonder fruit in moderate amounts. If you have any problem with your eyes and want to improve your vision, you may take the help of custard apple. The presence of vitamin A and C makes this fruit extremely beneficial for healthy eyesight. Further, the other antioxidants like riboflavin and vitamin B2 destroys the free radicals and fights and prevents various vision related issues. Those nine months are probably the most important phase in a woman’s life and she has to be extra careful while eating anything during that time. While some foods are a complete no-no, few are very effective during pregnancy with custard apple falling a part of the latter group. The highly nutritious custard apple gives the needed nutrients like vitamin A and C to the mother that helps in the healthy development of the fetus. Moreover, the copper content in it lessens the chances of premature labour and premature graying of hair while the iron content helps to ease the labor pain and increases the breast milk production in lactating mothers. Morning sickness that leads to feelings of vomiting, nausea, numbness and mood swings is common during pregnancy but can be prevented with adequate consumption of custard apple. However, please do avoid the consumption of the seeds and the unripe custard apple, as they might be harmful. Arthritis and rheumatism generally occur with old age but in few cases, even the younger lot may get affected. These diseases lead to problem in walking, excessive join paints and often swelling in body parts that can get really painful at times. However, not to worry as with custard apple consumption, you can get rid of these health issues. The rich magnesium content in it maintains normal fluid levels and fosters electrolyte balance in human body. This helps to get rid of the acids and fluids in the joints and reduces the inflammation that accompanies it. Anemia is quite common nowadays specially with women. Therefore, those of you who suffer from anemia or has anemic tendencies must consume foods that help you get rid of the problem and custard apple is definitely one of them. Custard apple is a rich source of iron that helps in the cure of anemia. It also contains copper that improves the hemoglobin content in body and hence help you battle the problem of anemia. Moreover, custard apple is a coolant, stimulant, hematinic and expectorant that helps to get rid of vomiting tendencies, dizziness and other side effects of anemia and promotes the general well being of the individual. .
Hormonal imbalance can create lot of health issues with emotional disorders being one of the major consequences. However, custard apple is efficient in balancing the hormonal problems. The vitamin B6 present in it regulates the hormonal levels in body and hence gives your body the strength to cope up and battle the emotional disorders. Custard apple is rich in vitamin C that helps in the formation of cartilage, ligaments and tendons. It is also a natural cure for treating various kinds of ulcers, boils and abscesses. Custard apple juice also helps in the fast healing of cuts and wounds and also facilitates new cell development in the skin layers. In addition, the latex derived from the custard apple tree is used in treating various skin diseases like eczema, inflammation and psoriasis. Many of us are prone to cough and cold and fall sick every alternate day. The main reason behind it is your weak immune system. However, studies have shown that custard apple contain antimicrobial properties, which can help you get rid of various pathogens and protect yourself from various infections. The vitamin C content in custard apple improves your resistance power to prevent cold and cough from occurring. It facilitates the absorption of iron by the body that further helps your body fight diseases. Custard apple also acts as a febrifuge curing the fever that often accompanies common cold and cough. Eat custard apple (Sitaphal or Sharifa) only in moderate amounts. Best way to have custard apple is to wash it properly, peel off its skin and eat the pulp. The black or brown colored seeds are not supposed to be eaten. You may also like to extract the pulp of the custard apple and use it to make shake and other drinks. It tastes good and has aromatic smell. The seeds are often found to be poisonous so it is better to avoid consuming them as much as possible. The fruit is cold in nature so do not consume in huge amounts to avoid falling sick. Although it is good for diabetes but patients, suffering from gestational diabetes must avoid excess consumption of it as it contains high sugar that may harm you. Also eating in excess can lead to too much weight gain. The sap of the branches of the custard apple tree can be an irritant and harm your eyes. Therefore, you need to be careful with that. Custard apple contains dietary fiber that if taken in huge amounts will interfere with the nutrient absorbing capability of body and result to various stomach problems. Potassium content lowers the high-pressure in body but if taken excessively in the form of large numbers of custard apple can lower your blood pressure to dangerously low levels, which in turn may result to nausea, dizziness and other problems. Do consume it under doctor’s advice if you are under some medications as in some cases, it can interact with certain medicines and lead to complications. The above-mentioned points are just the simple precautions I gave but that does not in any way lower the efficiency of custard apple in battling diseases. 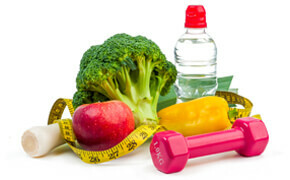 You just need to eat in moderate amounts and avoid overeating. In case of medical complications, you must consume under medical advice only. Most of the fruits are healthy and nutritious with custard apple being no exception. Since time immemorial, this wonder fruit has been used for treating various health issues. Besides the health benefits of custard apple, it also helps in skin and hair care. I have done thorough research and found out its potentiality in treating various life threatening diseases like diabetes, cancer etc. It further strengthens your immune system and thus boosts the physical health. However one can never ignore the precautions and hence I have jotted down some points about how to eat custard apple for maximum benefits, which will hopefully help you. In other words, do consume it but keeping my suggestions in mind so that you can reap the maximum health benefits of custard apple. Also, take medical help in case you notice any side effects. Do you eat custard apple? Have you checked out the health benefits of custard apple? Do share me the feedback and do not forget to like, share and comment if you find it beneficial. Until then stay safe and enjoy eating custard apples. Glad you liked that. Keep coming.